2016 Ktm exc-f with accessories. Watch this YOUTUBE video with a walk through. 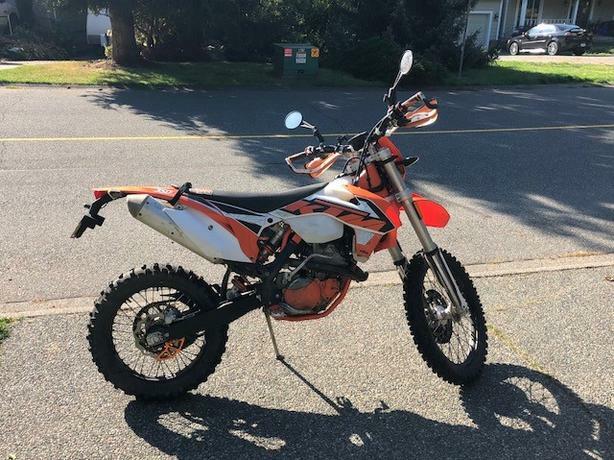 2016 Ktm 350 exc-f with 90 hours and 2,340kms. Very well maintained at Action motor sports. All services and oil changes done on or before recommended time. Valve checked twice (second times a few weeks ago). Has the Australia mapping and runs perfectly. This is a great bike and I will be sad to see it go. Reason for selling is we bought a four seater side x side so the entire family can go on adventures and not just me. I will be keeping the lowered foot pegs, fold down Mirrors and handle bar risers. I spent a lot of money on parts to protect the bike. It has been taken off road and the plastics do have scratches and the front light lense cover has a hair line crack. This bike has never had any bad wipe outs and was meticulously maintained and cared for. Click or cut and paste the YOUTUBE video link above to view the bike.